There is much more than a lower rate and payment to determine whether to refinance a mortgage. Lenders try to make refinancing as attractive as possible by rolling the closing costs into the new mortgage so there isn't any out of pocket cash required. The closing costs associated with a new loan could add several thousand dollars to your mortgage balance. The following suggestions may help you to reduce the expense to refinance.
? Tell the lender up-front that you want to have the loan quoted with minimal closing costs.
? Check with your existing lender to see if the rate and closing costs might be cheaper.
? Shop around with other lenders and compare rate and closing costs.
? If you're refinancing an FHA or VA loan, consider the streamline refinance.
? Credit unions may have lower closing costs because they are generally loaning deposits and their cost of funds is less.
? Reducing the loan-to-value so mortgage insurance is not required will reduce expenses and lower the payment.
? Ask if the lender can use an AVM, automated valuation model, instead of an appraisal.
? You may not need a new survey if no changes have been made.
? There may be a discount on the mortgagee's title policy available on a refinance.
? Consider a 15-year loan. If you can afford the higher payments, you can expect a lower interest rate than a 30-year loan and obviously, it will build equity faster and pay off in half the time. A lender must provide you a list of the fees involved with making the loan within 3 days of making a loan application in the form of a Loan Estimate and a Closing Disclosure Form. Every dollar counts, and they belong to you. Moisture is mold's best friend and it thrives between 40 and 100 degrees Fahrenheit which is why it is commonly found in homes. Mold spores float in the air and can grow on virtually any substance with moisture including tile, wood, drywall, paper, carpet, and food. Moisture control and eliminating water problems are key to preventing mold. Common sources of moisture can be roof leaks, indoor plumbing leaks, outdoor drainage problems, damp basements or crawl spaces, steam from bathrooms or kitchen, condensation on cool surfaces, humidifiers, wet clothes drying inside, or improper ventilation of heating and cooking appliances. The EPA suggests that if the moldy area is less than ten square feet, you can probably handle the cleanup yourself. If the affected area is larger than that, find a contractor or professional service provider. Increasing ventilation in a bathroom by running a fan for at least 30 minutes or opening a window can help remove moisture and control mold growth. After showering, squeegee the walls and doors. Wipe wet areas with dry towels. Cleaning more frequently will also prevent mold from recurring or keep it to a minimum. A simple solution to clean most mold is a 1:8 bleach/water mixture. Since homes have thermostatically controlled temperatures and water is used all day long in the kitchen and bathrooms, the environment is conducive to mold. See Ten things you should know about mold written by the EPA. It’s understandable; you’re excited; you’ve found the right home, negotiated a contract, made a loan application and inspections. Closing is not that far away, and you are making plans to move and put personal touches on your new home. Even if you have an initial approval on your mortgage, little things can derail the process which isn’t over until the papers are signed at settlement and funds distributed to the seller. The verifications are usually done again just prior to the closing to determine if there have been any material changes to the borrower’s credit or income that might disqualify them. Your real estate professional and lender are working together to get you into your new home. It’s understandable to be excited and feel you need to be getting ready for the move. Planning is fine but don’t do anything that would affect your credit or income while you’re waiting to sign the final papers at settlement. Mortgage rates have risen 0.5% in 2018 on 30-year and 15-year fixed rate mortgages and experts expect them to continue to increase. Buyers paying attention to the market understand the relationship that inventory has on pricing; when the supply is low, the price usually goes up. Rising interest rates can affect the cost of homes also. When interest rates go up, fewer people can afford homes. Lower numbers of buyers can affect the demand, which could cause prices of homes to come down. The question is how much do the interest rates have to go up to affect demand? As the rates gradually go up, the affect may not be noticeable at all except for the fact that the payments for the buyer have increased. A ½% change in interest is approximately equal to a 5% change in price. A $300,000 mortgage at 4.5% for a 30-year term will have a $1,520.06 principal and interest payment. If the mortgage rate goes up 0.5%, it would affect the payment the same as if the price had gone up 5%. The difference in payments for the full term of the loan would be $32,547. There are some things beyond buyers’ control, but indecision isn’t one of them. If they haven’t found the “right” home yet, it is understandable. However, when that home does present itself, the buyer needs to be ready to make a decision. If they are preapproved and have done their due diligence in the market, they should be able to contract before significant changes occur in the mortgage rates. Along with all the planning of what you're going to do and where you're going to stay, consider this checklist to make you feel more comfortable while you're away from home. Ask a trusted friend to pick up your mail, newspaper and keep yard picked up to avoid an appearance of not being at home. Stop your mail (USPS Hold Mail Service) and your newspaper. Don't post about your trip on Facebook and other social media until you return; some burglars look for this type of announcement to schedule their activities. Do notify police or neighborhood watch - especially if you're going to be gone for more than just a few days. Let your monitoring service know when you'll be gone and if someone will be checking on your home for you. Light timers make it look like someone is home. Set multiple timers for various times to better simulate someone at home. There are plug-in modules for lights and appliances that would allow you to control them from your phone while your out of town. Do unplug certain appliances - TV, computers, toaster ovens that use electricity even when they're off and to protect them from power surges. Don't hide a key; burglars know exactly where to look for your key and it only takes them a moment to check under the mat, above the door, in the flower pot or in a fake rock. These easy-to-handle suggestions may protect your belongings while you're gone while adding a level of serenity to your trip. When comparing the cost of owning a home to renting, there is more than the difference in house payment against the rent currently being paid. It very well could be lower than the rent but when you consider the other benefits, owning could be much lower than renting. Each mortgage payment has an amount that is used to pay down the principal which is building equity for the owner. Similarly, the home appreciates over time which also benefits the owner by increasing their equity. There are additional expenses for owning a home that renters don't have like repairs and possibly, a homeowner's association. To get a clear picture, look at the following example of a $300,000 home with a 3.5% down payment on a 4.5%, 30-year mortgage. The total payment is $2,264 including principal, interest, property taxes, property and mortgage insurance. However, when you consider the monthly principal reduction, appreciation, maintenance and HOA, the net cost of housing is $1,218. It costs $1,282 more to rent at $2,500 a month than to own. In a year's time, it would cost $15,000 more to rent than to own which is more than the down payment and closing costs to buy the home. With normal amortization and 3% annual appreciation, the $10,500 down payment in this example turns into $112,00 in equity in seven years. Check out your own numbers using the Rent vs. Own or call me at (808) 523-7653. Owning a home makes sense and can be one of the best investments a person will ever make. 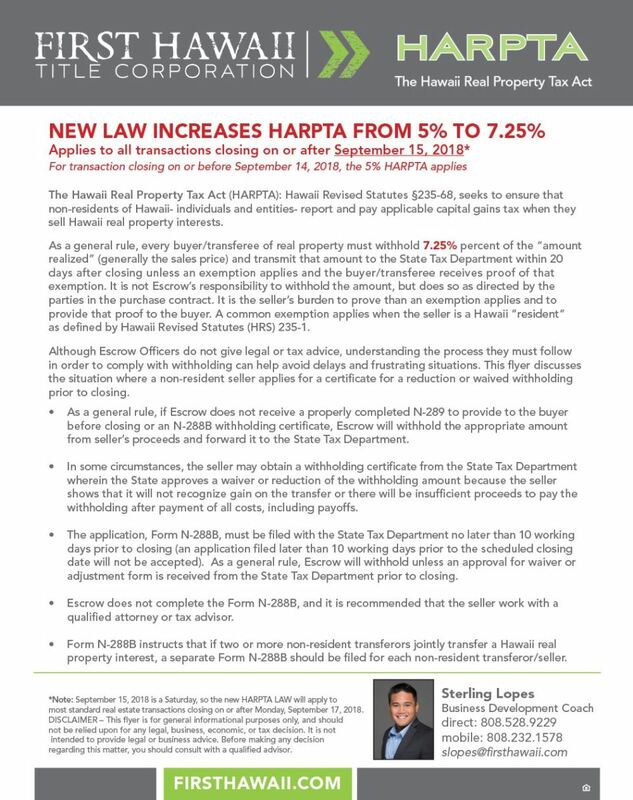 Below is a summary of a new Hawaii law regarding withholding of funds for the State of Hawaii Tax Collector. Did you occupy the unit 2 of the last 5 years? 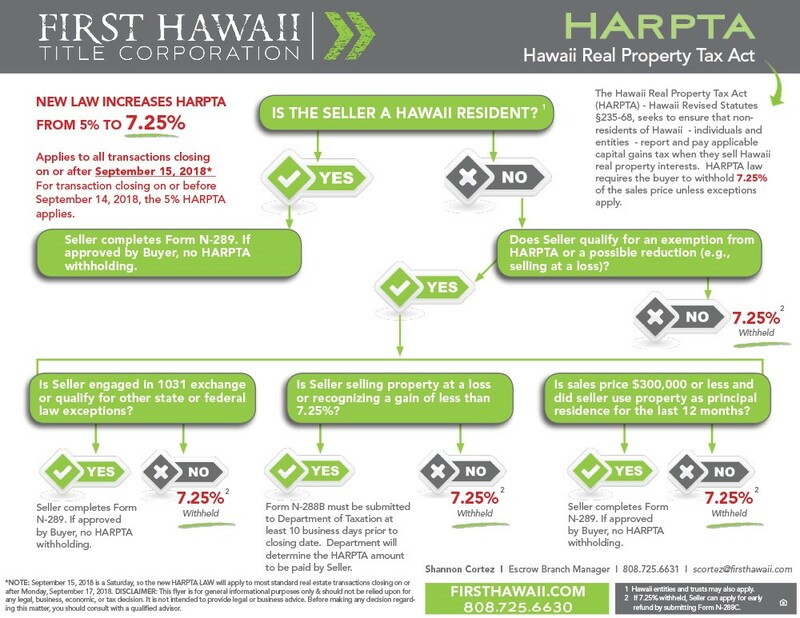 If not and unless you have received an exemption from the State of Hawaii Tax Collector, it appears that escrow at closing will be required to withhold 7.25% of the sales price if a sale on the property closes AFTER September 14, 2018. You should consult with your tax preparer or tax attorney regarding taxes. Call me if you have any questions. Acquisition Debt is the amount of money borrowed used to buy, build or improve a principal residence or second home. Under the new tax law, mortgages taken after 12/14/17 are limited to a combination of $750,000 on the first and second homes. The mortgage interest on this debt is tax deductible when itemizing deductions. It is a dynamic number that is reduced with each payment as the unpaid balance goes down. The only way to increase acquisition debt is to borrow money to make capital improvements. Prior to the new law, homeowners could additionally borrow up to $100,000 of home equity debt for any purpose and deduct the interest when itemizing deductions. Mortgage interest on home equity debt is no longer deductible unless it is for capital improvements. Acquisition debt cannot be increased by refinancing. Some confusion occurs because mortgage lenders are concerned in making home loans that will be repaid according the terms of the note and using the home as collateral. That does not include making a tax-deductible mortgage. Another thing that adds confusion to the issue is that the lenders will annually report how much interest was paid in a year but only the amount that is attributable to acquisition debt is deductible. Even if the interest on the cash-out refinance is not deductible, it may be advantageous to pay off higher interest debt such as credit card debt and replacing it with lower mortgage debt. It is the responsibility of the taxpayer to know what part of their mortgage debt is deductible. The challenge becomes more difficult after a cash-out refinance. Homeowners should keep records of all financing and capital improvements and consult with their tax professional. It's common for Sellers to consider offering a home warranty or protection plan to make their home more marketable. A growing number of homeowners are now purchasing this type of protection for themselves to limit the unexpected expenses of repairs and replacements. A home protection plan is a renewable service contract that covers the repair or replacement of many of the components in a home. Some homeowners especially like the convenience that it organizes a qualified service provider as well as the cost of the repairs or replacements. There are a variety of companies that offer home warranties and the coverage may differ but the majority of things will include heating, air conditioning, most built-in and some free-standing appliances, as well as other specific items. Additional specific coverage may be available for other items like pool and spa equipment. Some investors are even placing this coverage on their rental properties to limit the amount of repairs during the year. It is a viable way to manage the financial risk and the stress dealing with unexpected expenses. Call me at (808) 523-7653 if you'd like a recommendation of available programs.